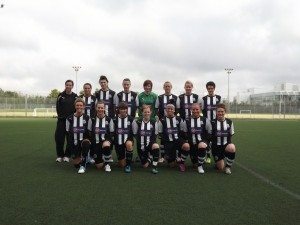 It is hard to believe that this time last season Newcastle United Women’s Football Club were preparing to start life in the Northern Combination League following their relegation from the FA Women’s Premier League. But a season is a long time in football and the NUWFC squad have proved that if you really want something in life and are prepared to work hard there is a really good chance you can achieve your goal. Sunday 19th of August will see NUWFC return to the FA Women’s Premier League at the first time of asking. The managers, coaches and players all know life in the FA Women’s Premier League will not be easy. The standard of football is high and the competition is strong, professional and committed and the team will have to work hard and stay focused at all times. NUWFC will start the season without First Team Captain, Sarah Wilson, who proved last season that a strong leader is important when things are not going as well as you would like. Sarah made sure the team worked hard and stayed together with one aim in mind promotion and returning to play in the FA Women’s Premier League. 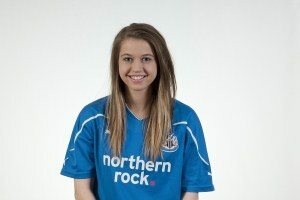 Sarah said from her base in Iceland “The start of the season is always a nervous but exciting time, especially for us at NUWFC. We had a fantastic season last year, taking both the League and County Cup title. The girls have been working very hard over the summer to ensure that we’re ready to compete in the FA Women’s Premier League. It’s a big step up from last year, we understand that it’s going to take a lot of hard work and extra commitment, but as a team we are ready for the challenge, starting this Sunday against Nottingham Forest. Newcastle United Women’s Team will travel thousands of miles during the season, which will include very early starts to the day to compete at this level but the long tiring Sundays are worth it and NUWFC are determined to prove that they are worthy of this league. The squad have been back in training since early June and a pre-season trip to Scotland helped the new members of the squad get to know their team mates and find out just what a great team NUWFC are off the pitch as well as on it.